The soldiers of the SS left the town on 6 June 1944. Thanks to the actions of the Resistance and individuals, the Allies were informed that the Germans had left Bayeux, and that there was no point in bombing: the town was thus unharmed. 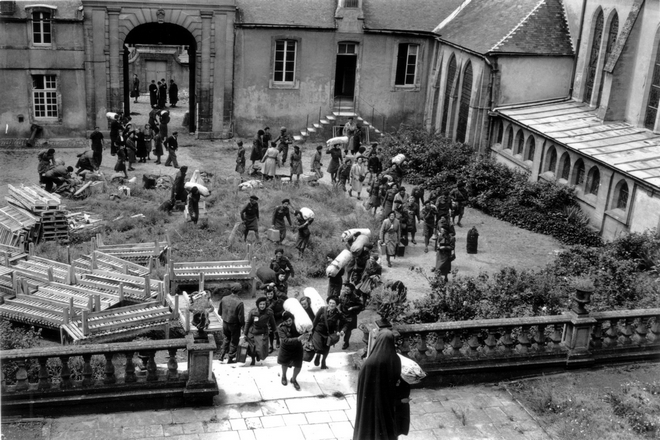 With its proximity to the Landings beaches, Bayeux became a transit hub for both soldiers and civilians. The town was strategically positioned for the Allies with thousands of soldiers and vehicles passing through on their way to the combat zones. But their machines could not get through the narrow streets of the medieval city. Allied engineering units built a road around the town – the Bypass – to facilitate the flow of traffic. On 14 June 1944, General De Gaulle landed in Normandy and went straight to Bayeux where he gave his first speech on French soil. The enthusiastic reception from the crowd of citizens served to demonstrate De Gaulle’s legitimacy in the eyes of the Allies as the leader of liberated France. For De Gaulle this visit was of vital significance because it confirmed the authority of his provisional Government of the Republic of France vis-a-vis the British and Americans. Until then they had refused to accept that he represented France and would not entrust him with the country’s destiny. Before he left, de Gaulle appointed François Coulet as Commissioner of the Republic and gave him the task of re-establishing a legally constituted government in France. In summer 1944 Bayeux became the French capital until Paris was liberated on 25 August. "La Renaissance Le Bessin" (Re-birth of the Bessin), was the first newspaper to be printed in liberated France after the 1944 Landings. Founded by members of the Resistance, it is still published twice a week.